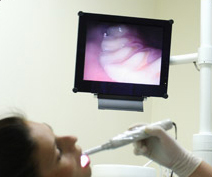 An intraoral camera allows us to work with you as a team to meet your dental care goals. You can see exactly what we see in your mouth. Our intraoral camera displays your teeth on a monitor, showing any areas of decay, cracks in your teeth, broken fillings and much more. It is one of the most powerful tools we have in helping you understand the treatment you will receive and why it is necessary. We believe informed patients make great decisions about their oral healthcare, so we encourage your questions and are eager to discuss your treatment options with you. We want you to picture how your appearance will improve with dental care, giving you all the more reason to smile.